USD – Next week’s business activity and payrolls data should keep Fed rate expectations and the USD supported. EUR – We do not expect incoming inflation data to have any meaningful impact on rate expectations and the EUR. CAD – Growth data is unlikely to trigger bigger changes to rate expectations and the CAD. We expect oil price developments to remain key. 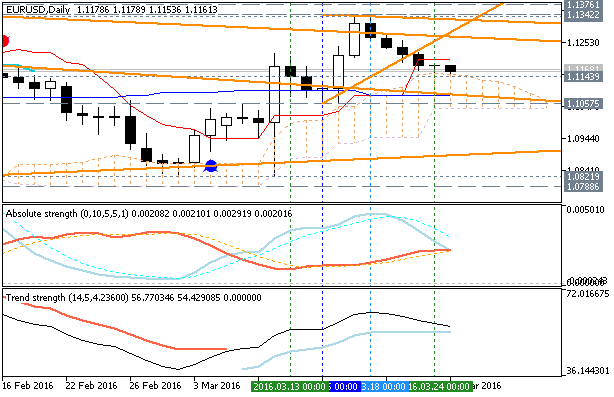 EUR/USD: correction to bearish reversal. Daily price is on the secondary correction within the primary bullish market condition: the price is located near and above Ichimoku cloud and Senkou Span line which is the virtual border between the primary bearish and the primary bullish trend on the chart. If the price breaks 1.1143 key support level on the daily close bar so the bearish reversal will be started with the secondary ranging: the price will be located inside Ichimoku cloud. 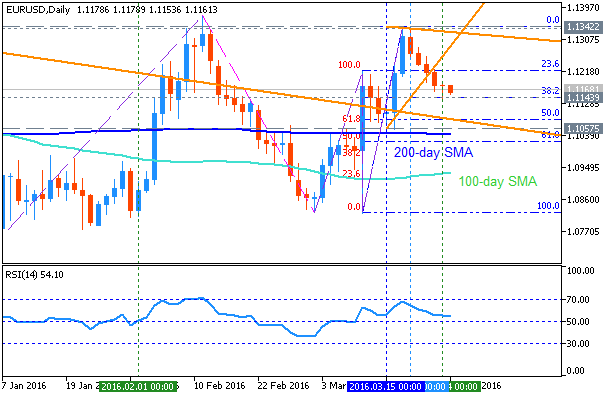 If the price breaks 1.1342 resistance level so the bullish trend will be continuing. Chinkou Span line is located near and above the price to be ready to break it to below for the good possible bearish breakdown. The US dollar managed to claw back some of its previous losses on the week leading to Easter. US CB Consumer Confidence, Janet Yellen’s speech, and the buildup to the all-important Non-Farm Payrolls report all stand out. These are the important events on forex calendar. US CB Consumer Confidence: Tuesday, 14:00. Consumer confidence declined to a seven-month low of 92.2 in February from 98.1 posted in January. The fall was due to negative views on business conditions and personal finances; however the overall picture suggests moderate economic expansion. Economists expected only a slight fall to 97.4. Consumers continued to favorably assess the labor market progress but to a lesser extent. Consumer sentiment is expected to improve to 93.9 in March. Janet Yellen speaks: Tuesday, 16:30. Federal Reserve Chair Janet Yellen will speak in New York. In her speech titled “Economic Outlook and Monetary Policy” she may refer to the Fed’s decision to cut the number of rate hikes in 2016 amid lower growth and inflation forecasts. Market volatility is expected. She may or may clear the confusion created by the dovish Fed decision and the consequent hawkish sounds. US ADP Non-Farm Employment Change: Wednesday, 12:15. The ADP National Employment Report showed a job gain of 214,000 in February, beating economists’ expectations for 185,000 jobs addition. Private payroll gains in the prior month were revised down to 193,000 from an originally reported 205,000 increase. Analysts believe that if the current job expansion continues, the economy would achieve full employment by mid-year. ADP report is expected to show a 194,000 job increase in March. US Crude Oil Inventories: Wednesday, 14:30. Crude oil prices continued to slide after U.S. Energy Information Administration showed commercial crude stashes rose 9.4 million barrels last week, reaching 532.5 million barrels; historically high levels for this time of year. Mark Carney speaks: Thursday, 8:00. BOE Governor Mark Carney will speak about financial stability in Tokyo. He may talk about the Brexit debate in the UK and its possible effects on the UK and the Eurozone. Volatility can be expected. We have seen rising chances of a Brexit following the Brussels bombings. This has an impact on the pound as well as the euro. Canadian GDP: Thursday, 12:30. The Canadian economy expanded 0.2% in December exceeding market forecast of 0.1% gain. However, despite this rise, GDP faltered in the fourth quarter due to fewer business investments and an ongoing reduction in commodity-prices, closing a difficult year. The weakness in 2015 continues to weigh on Canadian economy in 2016 as crude oil prices declined below $30 a barrel until recently prompting oil and gas companies to undertake a fresh round of cuts to payrolls and spending. GDP is predicted to rise 0.3% in January. US Unemployment Claims: Thursday, 12:30. The number of Americans filing new claims for unemployment benefits climbed modestly last week, rising 6,000 to a seasonally reading of 265,000. Economists expected a slightly higher figure of 267,000. The four-week moving average of claims inched up 250 to 259,750 last week. All in all, the labor market continues to demonstrate resilience despite minor volatility. The number of claims is estimated at 269,000 for this week. Chinese PMIs: Friday: the official one at 1:00 and the independent Caixin one at 1:45. The second largest economy has its forward looking purchasing managers’ indices in contraction territory for quite some time. However, the country committed to a minimal growth rate of 6.5% and also provided other stimulus measures such a cut in the RRR. Small rises are expected, with the official figure predicted to advance from 49 to 49.3 points and the independent one from 48 to 48.3. A score under 50 reflects contraction while a number above this figure represents expansion. US Non-Farm Payrolls: Friday, 12:30 The U.S. employment market posted a better-than-expected jobs gain of 242,000 in February, beating forecasts of 195,000 addition. The strong reading followed a 172,000 gain in January. Meanwhile, the unemployment rate remained steady at 4.9%. Despite the strong figure, hourly wages actually fell 3 cents and equating to a 2.2% annualized jump, lower than 2.5% in January. Economists expect a job gain of 208,000 in March. This time, we will not have the ISM PMIs available before the release, so the level of uncertainty is higher. US ISM Manufacturing PMI: Friday, 14:00. The Manufacturing sector contracted in February but at a slower pace, getting closer the 50 point line. The index of national factory activity rose to 49.5 from 48.2 the month before. Economists expected a lower reading of 48.5. The employment index increased to 48.5 from 45.9 a month ago. And the new orders posted 51.5. US ISM Manufacturing PMI is expected to cross to expansion territory in March reaching 50.8. W1 price is on primary bullish condition with secondary correction with good possibility to reversal. The price was on correction since the middle of january this year: price was bounced from 1.2922 to start to be ranging near Senkou Span line which is the virtual border between the primary bearish and the primary bullish trend on the chart. Tenkan-sen line crossed Kijun-sen line of Ichimoku indicator to below which is indicating the primary bearish market condition in the near future. Chinkou Span line is estimating the ranging condition by direction. Nearest support level is 1.2922 (W1). 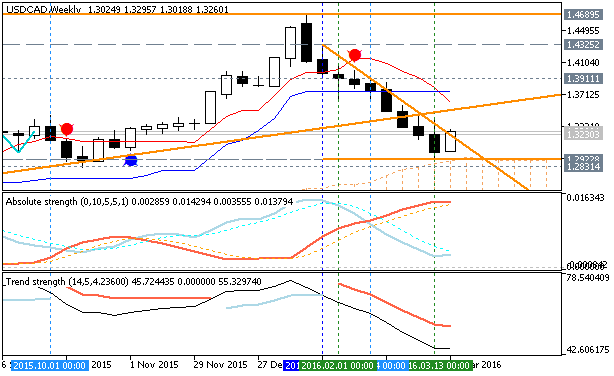 Nearest resistance levels are 1.3911 (W1) and 1.4325 (W1). If W1 price will break 1.2922 support level on close W1 bar so the reversal of the price movement from the primary bullish to the primary bearish trend will be started with the secondary ranging. If W1 price will break 1.3911 resistance level so the primary bullish trend will be continuing. If not so the price will be ranging within the level.